Aren’t they cute?! I found this at Gigei’s Deviantart page and just had to share it! On behalf of the entire HP Admin Staff, here is a quote from Ginny. We hope it will console you. Thanks to Loleia for this art! 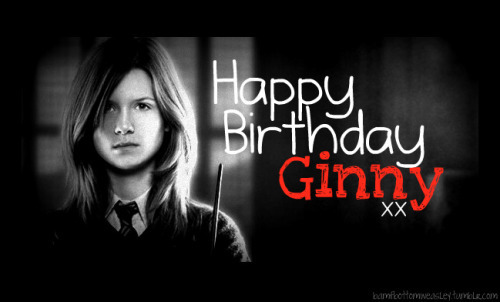 Happy birthday to Ginerva “Ginny” Molly Potter nee Weasley! She celebrated her 31st birthday yesterday! Food shortages across the Sahel region of Western Africa have left more than 18 million people on the brink of starvation. This statement, taken from Sky News, sums up what Bonnie Wright is speaking out about. Wright, who played Ginny Weasley, came back from a trip to Senegal with hopes of raising awareness for food shortages there and elsewhere in Africa. Wright visited Kedougou in southern Senegal to meet vulnerable families who are counting on humanitarian assistance to survive. She said: “When I arrived in Senegal it was hard to see that this was a country where thousands of people are suffering from extreme hunger. “Where you may expect the landscape to be dry and dusty, in fact everywhere was green and lush. Props to Bonnie for her humanitarian agenda. Read more about Africa’s food crisis in the original article. Severus, I was beginning to worry that you had lost your way. I’m back! Just returned and I am ready to catch up on some Potter news! To start off, I was wondering if any of you looked up to anyone in the series, and why. My answer is Hermione because I admire her loyalty, independence, and intelligence. I am a bit of a nerd, so she is a good character to look up to. I also am fond of Ginny for her strength and resilience in spite of her troubles. For all those who ship Hinny. Have a look at these life-like infant dolls, Based on Harry Potter Characters, Creepy or cute?